With shoes off and feet bare, Kai plays the piano in the forest nicely. The tone of Kai’s piano has a mysteriously attractive quality to it, and Shuhei is hugely touched by the sound that Kai brings out. Yet Kai says he has “never learned how to play a piano in his life.” Kai shocks Shuhei who devotes himself to practicing the piano to become a professional pianist like his father. One day, Shuhei invites Kai to his home and lets him play the piano, but Kai’s playing on a regular piano is strangely unbearable to listen to. The next day, Shuhei tells his music teacher Ajino, about how Kai can play the piano in the forest and how wonderful the sound is. Ajino used to be a famous piano player and he is the one who knows the secret of the piano in the forest. Ajino steps into the “Piano Forest” at night and finds Kai playing the piano. The sound touches Ajino’s heartstrings as well. Ajino asks Kai, “Why don’t we work on the piano practice together?” Kai feels that he is intruded upon and rages home. Kai visits Shuhei’s house again and listens to Shuhei playing the piano. When Shuhei learns about what Ajino has said to Kai, he tries to persuade Kai that “ This is your chance to improve your skills.” Kai however, shows no interest and Shuhei is unable to say anything more. Shuhei feels jealous of Kai, who is offered a lesson from Ajino, who once refused to teach Shuhei. On his way home, Kai is unable to calm himself and stops by the music room in the school and runs into Ajino. Ajino plays one tune after another on the piano. Kai is forced to listen, but soon his eyes begin to light up with excitement. Kai plays the tune he learned on the piano in the forest and is able to play everything except Chopin. The Chopin tune forces Kai to beg Ajino, “Teach me Chopin! !” Ajino sets one condition to Kai in exchange for giving him a Chopin lesson. - “he must enter a piano competition.” Kai happens to participate in the piano competition in which Shuhei is also scheduled to join…. Kai, with the talent of a genius and hardworking Shuhei. The “passionate drama of friendship and struggle” over the piano between these two young boys will unfold on the silver screen. 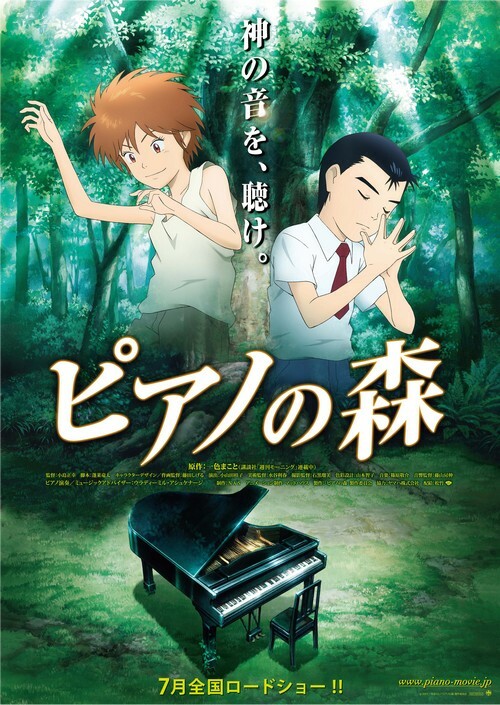 The film is based on a very popular manga work “Piano no Mori” presently published in serial form in Kodansha’s weekly comic magazine Morning. Animation production is by MADHOUSE, which also produced TV animation “HANADA SHONEN SHI” (directed by Masayuki Kojima). The studio’s 2006 feature-length production and release “Paprika” (directed by Satoshi Kon) took part in the Venice Film Festival’s competition, and “The Girl Who Leapt Through Time” (directed by Mamoru Hosoda) released the same year won the 30th Japan Academy Prize under the newly established Best Animation category while garnering many other awards.